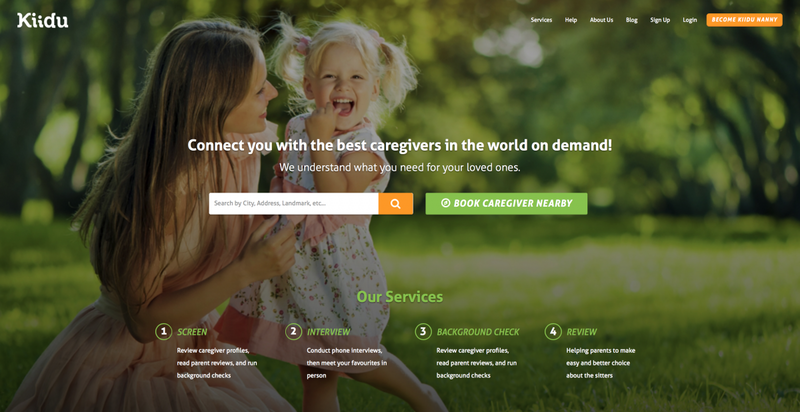 Kiidu is the 1st online company in South East Asia to provide caregivers on demand. Kiidu is an online platform that connects parents with qualified and trustworthy caregivers easily. Kiidu being a startup company, is growing and expanding at an average of 20% monthly. We have more than 1000+ nannies in our data base. We are proud to say that Kiidu has been providing its services in entire Thailand in only 5 months. Kiidu is a real time booking platform that fills a clear gap in the babysitter field and leverages systems that will prove to be enormously effective for our successful company on demand. We have a very quick response rate of average 55 seconds to each customer request. 87.5% of all the customers have been satisfied with our service. We do background checks and personal interviews. Kiidu has also collaborated with the Bangkok Nanny Center for workshops and training sessions. This centre is verified by Siriraj Hospital, a reputed hospital in Thailand.We have recently worked with a well reputed professional trainer for caregivers, Ms.Kate Jackson in conducting workshops and certification courses.We are proud to work with them in making our caregivers better qualified and perform better in their jobs. Kiidu takes its origin from an experienced mother.She wanted to solve the decade long problem in finding babysitters and helpers, she could trust her kids with during her transient stays ranging from Europe, Middle East and Asia. The founder met another Indian and Thai girl, shared their difficulties, serendipity stepped in and based on their inherent skills and experiences, decided to launch Kiidu, to help others just like them. Due to their experience, they work passionately along with people and the community they built, reflecting a truly international world. This gives Kiidu a competitive edge in cultural assimilation, better understanding of the work force and knowing how it feels to live and work in an alien country. Kiidu is very proud to have David Shelters as its Chief Financial Officer. David possesses twenty years of entrepreneurial experience as a founder, co-founder, board advisor and mentor to numerous tech start-ups in both America and Asia. He currently serves as an external consultant for MBMG Group, a leading corporate advisory firm. David continues to be an active advocate and participant in the Thai start-up scene frequently participating as a key note speaker, moderator, panelist and pitch judge at local start-up events. David has written extensively on advising tech start-ups, owns 2 blogs and has published several entrepreneurial related articles in several of the leading newspapers.Additionally, he lectures on entrepreneurship and advises entrepreneurial students in several of the leading university programs in Thailand. Being an online platform, Kiidu has some unique features that have changed the old style of finding a caregiver. Our features like online screening, telephonic interview and booking the caregiver online has made parents to hire the caregiver within no time. Parents can even review and rate the caregivers upon their experience with the nanny/Maid. This will not only help the caregiver to get a good family in future but will also help parents to select the most appropriate caregiver for their loved one. Our platform is free for all nannies to register. This helps them to find work quickly with a reliable family. We have caregivers from different nationalities, like Thai’s, Burmese and Filipinos. We have also some international students who are looking for part time jobs as Tutor and language teacher. Caregivers who really want to learn and improve their English skills, personal and professional development are welcome to join Kiidu family. Within 5 months of launching, we get 150+ caregiver profiles and 100+ customer requests per month. The stakeholders are also seeing this potential growth of Kiidu and are happy to collaborate with us. Each day, we are growing and the Kiidu family keeps getting bigger and bigger based on the ability to listen, undertake thorough background checks, understand and offer more insight and experience to parents. Kiidu gives you only the best caregivers and allow customers to select and meet through the platform www.kiidu.com. On our website, you will meet many skillful nannies and caregivers that match customer needs and family values. Testimonials, nanny-bios and all the relevant information are easily accessible on the website, which makes the process of finding help an enjoyable experience. Kiidu has expanded to several cities across Thailand and the company is also exploring opportunities for additional revenue. Kiidu is an online platform that connects parents with qualified and trustworthy nannies. The site enables parents to search, book and review trusted sitters within minutes. The headquarters is based in Bangkok. Kiidu is founded by a mom herself who faced the problem in finding the right nanny for her kids. Based on her experiences, she planned to launch KIIDU by joining with 2 other women. She wants to solve the problem and cover the whole of South East Asia by leveraging technology to power a faster, more personal babysitting service. For more information or to sign up, visit www.kiidu.com.